Mental Alertness equals Success. The ultimate formula combining GINGKO with other enhancing nutrients. Contains potent standadized extract. A unique formulation containing a blend of essential nutrients, herbs and co-factors. 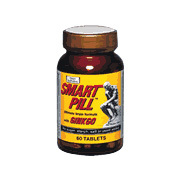 Adults two tablets daily, preferably with the morning or afternoon meal or as directed. No yeast, sugar, starch added. Smart Pill - is shipped in a discrete, unmarked package. Orders are processed immediately and usually take about 3 to 5 working days to be received. We do ask that you try it for 2 to 3 weeks to feel the full effects. Any information received is used only for order processing and shipping purposes. Your information, such as e-mail address, will never be disclosed to a third party.